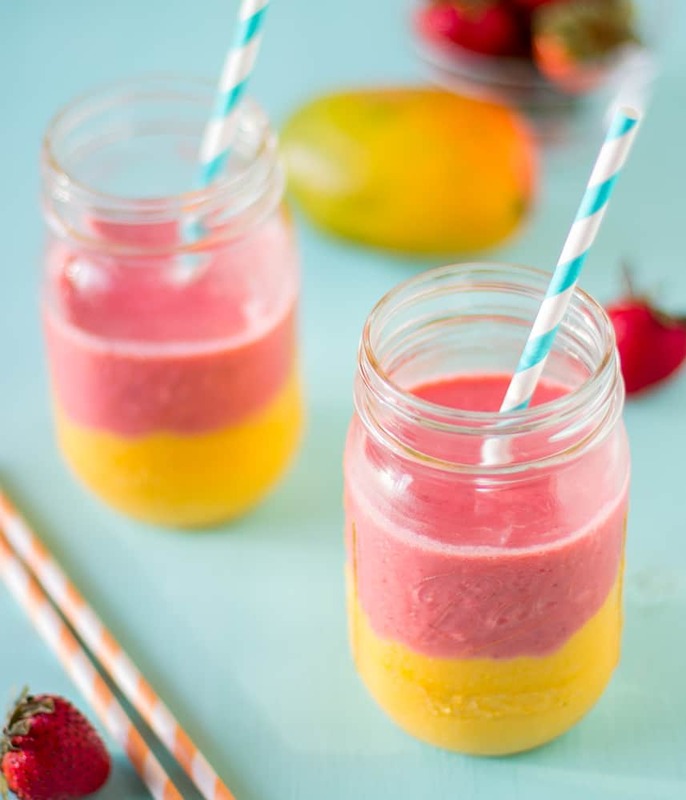 This Strawberry Mango Smoothie is filled with fruits and flavour, 5 ingredients and will transport you to a tropical country this summer! Greetings from sunny June! Yesterday we went to the beach for the first time in over two months and when I say I enjoyed it, I thoroughly enjoyed it. In my last post I mentioned that the beach is one of my favourite places; it’s a place that promises to be peaceful, calming and full of the best breeze you can get anywhere. Where’s your favourite relaxation spot? If you follow me on Instagram then you would’ve seen my post of the delicious fried fish and festival and the lobster that we eventually took home. Not only was the meal amazing and beyond my expectations, in typical Jamaican style we were also served with a slice of mango, watermelon and pineapple. Before touching my fish I went straight to the mango – kind of in love with mango. There are several kinds of mangoes here in Jamaica; my favourite being East Indian and Julie mangoes, thanks to their sweetness! If you get the opportunity please enjoy a fresh one over frozen chunks; you will not regret it. As soon as we got back home, I was in mango fever mode. Two mangoes and several strawberries later, this strawberry mango smoothie was born! I wanted to create something that allowed the pure taste of the mango and the strawberry to shine through. You will definitely feel as if you were on the beach with us when you take a sip of this smoothie. If you can get fresh mangoes then that is definitely the way to go – the flavour is irreplaceable. 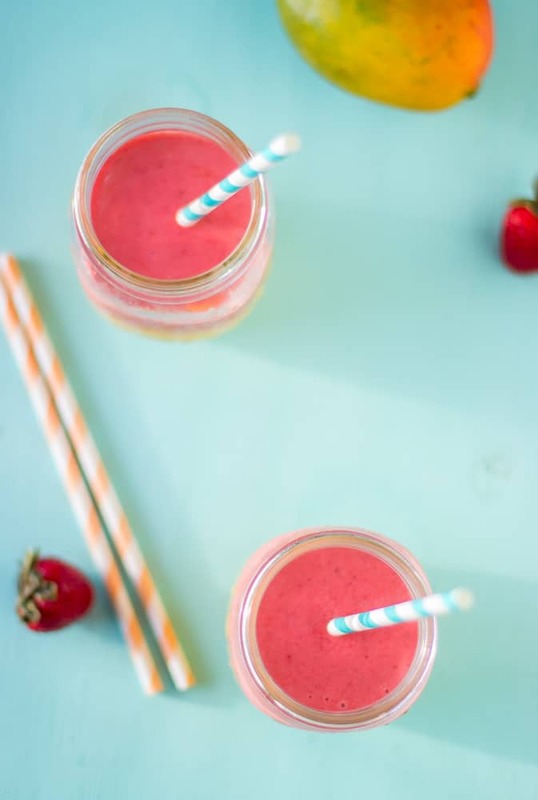 The strawberries can be frozen, and are actually better for the consistency of the smoothie. I specify sweet mangoes because the greek yogurt makes the mangoes creamy enough for a smoothie without affecting the taste, and so if your mangoes aren’t that sweet you can adjust the taste by adding a bit of honey or agave nectar. 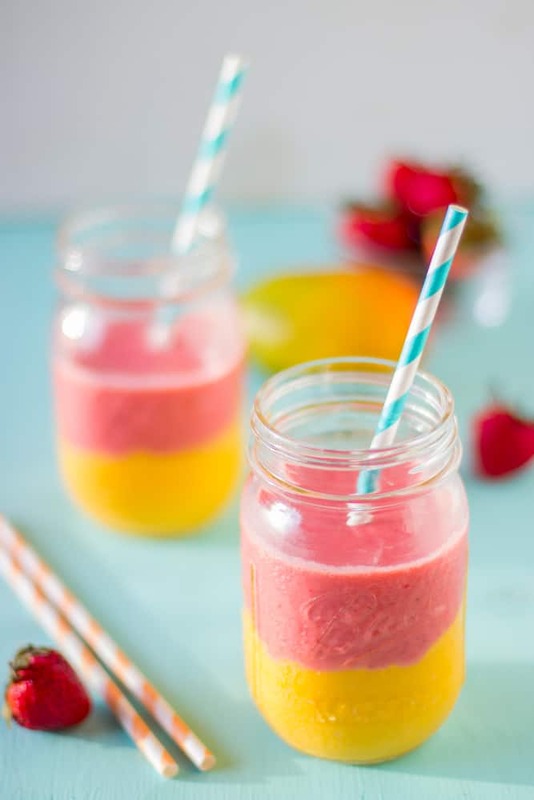 Along with the strawberry layer, which is a great addition to the mango, this smoothie is definitely the burst of flavour that you need. How have your sunnier days been so far? 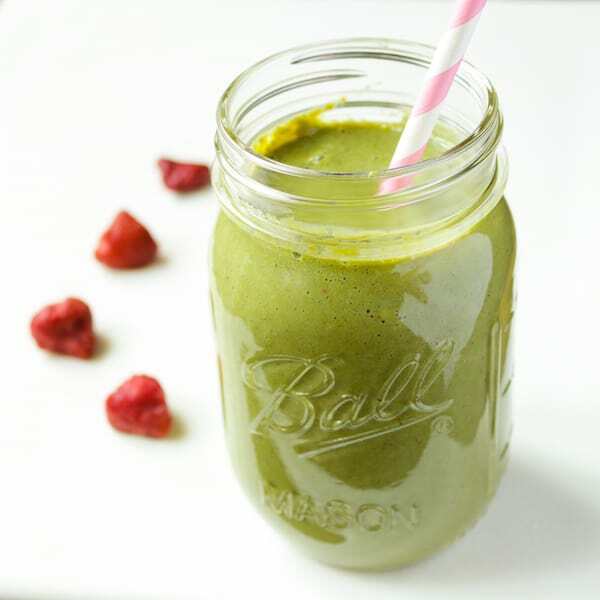 If you enjoyed this smoothie recipe, you’ll also enjoy this Strawberry and Kale Smoothie! 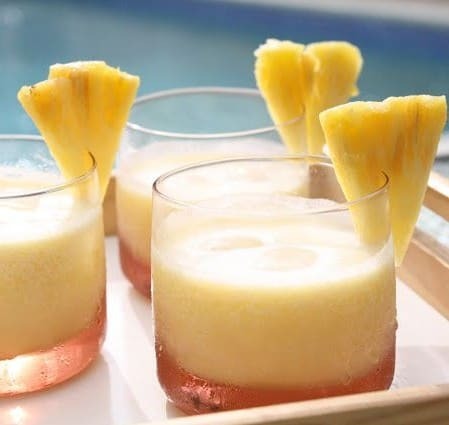 You’ll also enjoy this Pineapple Coconut Rum Cocktail! Check out all of my drink recipes! 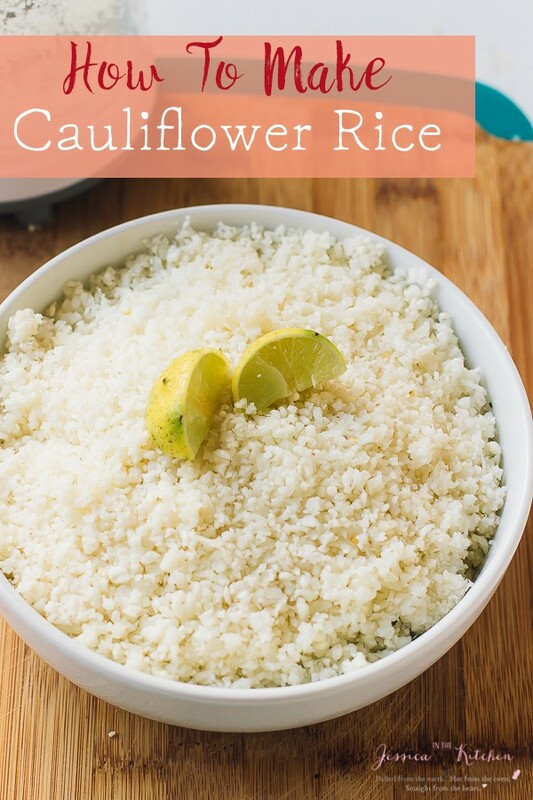 Blend all the ingredients together in a blender for 2 minutes until smooth, scraping down at each minute. 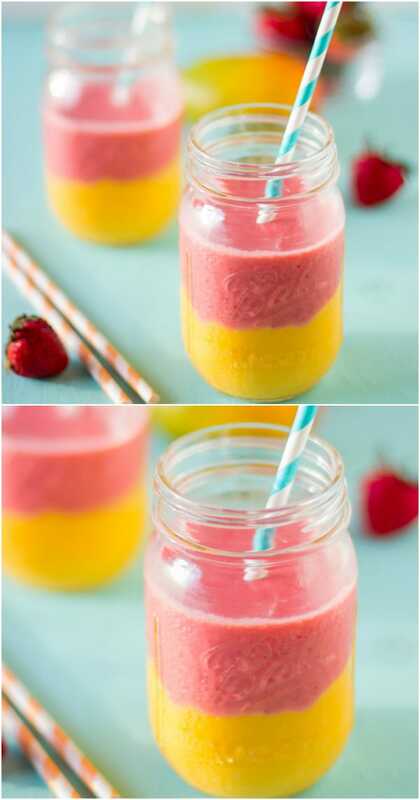 Pour half of the mango smoothie on the bottom of each jar, and half of the strawberry smoothie on each smoothie. Enjoy! So very pretty Jessica! Who could resist those gorgeous colors? Lovin it! Girl you did this right here! This smoothie is magical and I bet it tastes amazing!! Pinning! Thanks Marcie! It was delicious! I totally need this to start the day! YUM! The color is beautiful too. Haha yes, smoothies for the win! Thanks Sarah! 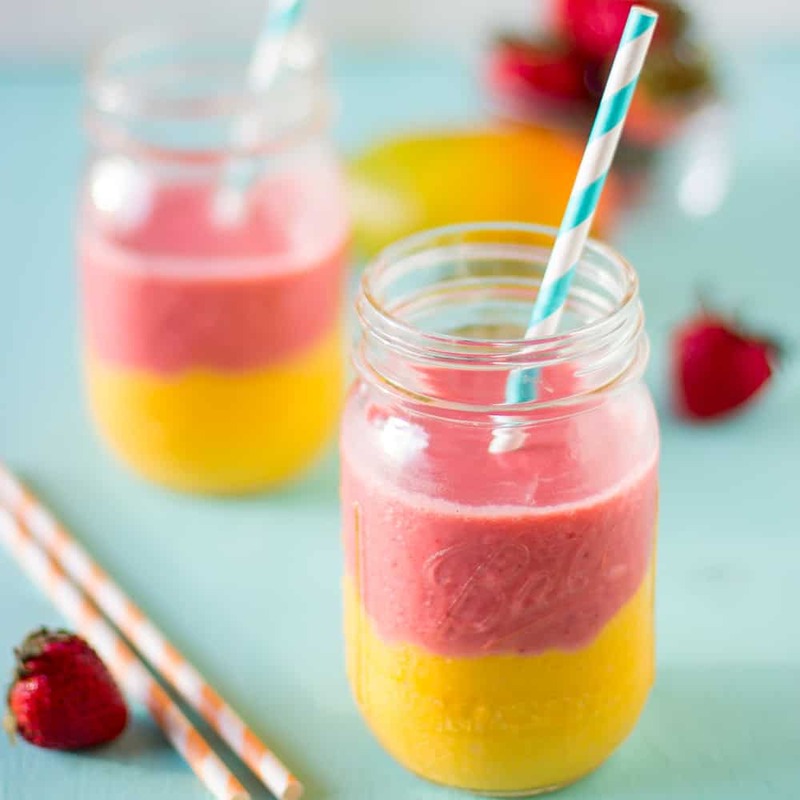 At first I thought this was just another smoothie, but I LOVE how you layered this! It looks BEAUTIFUL!! What time of day do you usually take your photos, I love the light in your pictures! Thanks Sophia! What I’m gonna say won’t be very fair – I took these photos at around 5:20 pm my time! I usually take photos between 4:00 – 5:30 pm & I shoot in RAW which really helps me to inject more light into the photos in the editing process :). I love love love mango in my smoothies! The vibrant colors totally match your bright personality, and I’m glad you decided to keep going with the tropical theme. I’ll be making myself a cup when I get home! I love the beach. We live far from one now and are in the woods. So now, I love the woods 😀 Sitting outside listening to the wind rustle through the trees and the birds chirping is so peaceful and relaxing. I love these beautiful layers. I need one of these. Thanks Cindy! The woods sound amazing! This looks so pretty, Jess! I’m bummed that this year our neighbor’s mango tree (which overhangs our property) isn’t bearing fruit. Love mangoes, and love getting them for free, wink wink. Good thing they’re abundant at the farmer’s market! Thanks for sharing. Aw thanks Jelli! I hope the tree bears mangoes soon! Mango smoothies are my absolute favorite so I am in love with this one with the pretty layers! 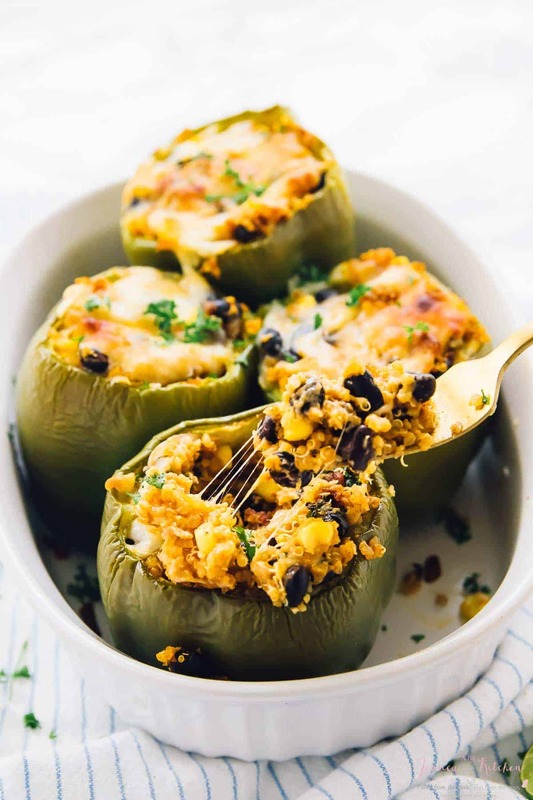 The bright vibrant colors are amazing and totally making me wish I had this right in front of me now – yum! I have to make this. I have a distinct feeling I would really like it! Thanks Ela! I know you would! The beach is my favorite vacation spot, too (although we have to travel pretty far to get to one)! We love the Carolina coast and usually get down there at least once a year – it’s such a fun, relaxing way to unplug and reconnect as a family! If this smoothie really can “transport me to a tropical country” then you know I’m picking Jamaica! (Look out … I’m packing my bags … 😀 ) Seriously, though – this is just beautiful! I love the layers!!! Pinning ASAP! Haha you’re welcome to Jamaica Shelley! Thanks! We have been sweating it out here in NYC, so I am definitely in smoothie mode! Love these double layers of deliciousness!! Thanks Joanne! This would def cool you down, Sincerely the Equator. Jessica, I LOVE how you kept the two layers of this smoothie separate. It looks so so juicy and tasty. I bet those 2 flavours compliment one another so well! Thanks Helen! They really did! Oh man do I love mango! This smoothie sounds awesome – love those two layers – so pretty! Aw, thanks Zainab and sorry to hear! You know you’re always welcome to our beaches 🙂 . What a fantastic idea J. Delish and stunning combi too. Jessica, I was TOTALLY drooling over your fish festival instas! And this smoothie is making me seriously consider having breakfast #2 🙂 Looks gorgeous! Oh this looks so summery and perfect! I just want to jump into the beautiful pictures and enjoy! !